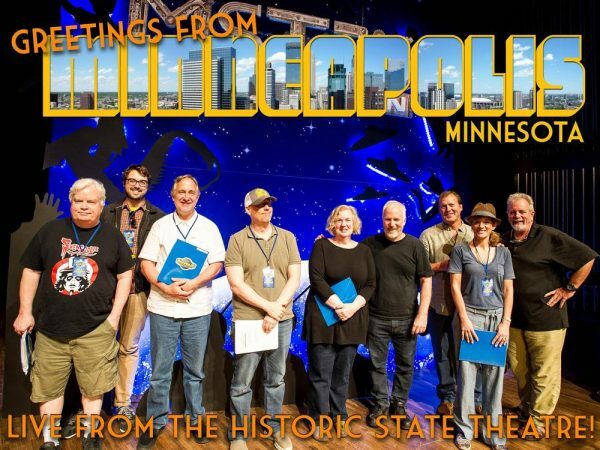 RiffTrax is ten years old, and to celebrate they put together their latest RiffTrax Live event packed to the gills with most of the cast of MST3K, leading to an amazing entry of RiffTrax Live. Not only do we get Mike Nelson, Kevin Murphy, and Bill Corbett, but they are joined by Mary Jo Pehl, Bridget Jones Nelson, Trace Beaulieu, Frank Conniff, Joel Hodgson, and newcomer Jonah Ray, making this the largest collection of MST3K alums performing at the same time ever! Some of it even helped erase the bad taste that was left in the mouths after the MST3K revival Kickstarter that came as news for practically everyone in the original cast except Joel, but mostly it was just a hilarious time that was one of the best RiffTrax Live events ever! From the start there were MST3K songs during the preshow slides (usually it’s a mix of funny songs from various artists), and the large volume of slides referenced a lot of RiffTrax episodes over the years including things like Setting Up A Room, Manos, and Santa and the Ice Cream Bunny. There were even references to a some of the RiffTrax VODs I haven’t even had time to watch, which shows not only how behind I am on RiffTrax watching but also how familiar I am with bad cinema that I recognized what they were from. That’s a weird thing to be happening, but it is. To start, each group of riffers got their own short, followed by the megariffing session where everyone came out. Mike, Keven, and Bill started things off with a ridiculous mess of a car safety short – A Talking Car, about a careless child brought before a tribunal of talking cars, one of which seems to want to feel that kids blood ground beneath its tires. Luckily for the kid, the two cooler-headed cars prevailed and we aren’t witnesses to child murder. Not that I would have been sad had this annoying child been destroyed. The kid is accompanied in the dream car tribunal by his loyal dog (it is unclear if the dog is also dreaming this), and the dog will growl and bare its teeth practically every time the old cranky car that wants the kid dead talks. Later the trio also tackled Shake Hands With Danger, a ridiculously gorey safety short that I saw them do live years ago and it was just as hilarious this time out. Bridget Nelson and Mary Jo Pehl paired up for a short about the kitchen of the future in a modern home, and how you women can conspire to teach your husband to buy you a new kitchen. Which in this case meant buy a new house with a new kitchen inside it! It featured Darren McGavin (best known to modern eyes as the dad from A Christmas Story) as the husband, and of course there were plenty of references to that as well as other good lines. Mary Jo and Bridget have become a regular team at RiffTrax with their own series of shorts that focus more on the types of films they’d make the girls watch in home ec back in the 1950s. Frank Conniff and Trace Beaulieu were up with More Dates for Kay, which I think is supposed to be a followup to the MST3Ked short What To Do On a Date. A hapless young lady who mopes around at home complaining that she doesn’t have a boyfriend gets a talking too from her older (married!) sister, who talks about her friend Kay (why this married, older woman is friends with a high schooler is not addressed!) The advice switches from basically go out and have fun and meet people and be friendly to the bizarre like do favors and pretend to be interested in every random boy that comes along in the off chance one asks you out. Also, the sister is totally not approving of Kay’s calling of boys. Frank and Trace straddle the border of working dirty with some of their lines (the short makes it soooooooooooo easy to turn everything sexual it’s crazy!) and Mike, Kevin, and Bill even joke about how Frank is dying to go blue but can’t. Probably the best riff of the night. Jonah Ray and Joel Hodgson come out for Americans At Work: Barbers, an AFL-CIO joint about how barbers and hairdressers are totally valuable workers, and also women take forever to look good. There was a hilarious running gag with a hairdresser who looked like Frankenstein that just got funnier and funnier. Jonah did well and showed he’ll do a good job as the new MST3K host, despite a line flub that got its own riff by Joel. Then it was time, the Riff-a-palooza! Everyone came out for a special short with the 1950s Superman selling saving stamps to young children! Shockingly, though we finally got Joel and Mike riffing at the same time (and everyone else! ), this wasn’t as good as I thought it would be, because the short itself was pretty darn tepid. Far too talky and not enough cheesy. Luckily, they seemed to pick up on this while putting the show together because we got a second short that was also riffed by everyone, and it was a recurring favorite: At Your Fingertips: Grass! That short is so awesome it alone is worth the price of admission, even with a lot of repeated lines. And now we can finally find out if corn is grass or not! Before I got I want to also mention there was a ten years of RiffTrax highlight video that was great and hopefully shows up online somewhere (and also reminded me there are a few of the mp3 riffs I haven’t watched yet, either!) Overall, this show ruled, the non-Superman shorts were largely amazing, and it was great seeing the old gang back together, even in a new together form. Hopefully this leads to more collaboration between the groups with more RiffTrax and more guest spots on the new MST3K. If you are someone how is more cautious with what you spend your money on but are a nominal fan of MST3K, it is well worth your dollars to go either see the rebroadcast or get the VOD when it is released. Disclosure: I donated to the Kickstarter for this RiffTrax.